Ideal dose using the Supremo blend is 18-19g for the double basket. I weighed 19g but level off some of the grounds. Anything more than 19g will cause the ground to hit the shower screen, resulting in channeling. Distribution: modified Stockfleth and then level off with a chopstick. Dosing & distribution was consistent throughout the test. 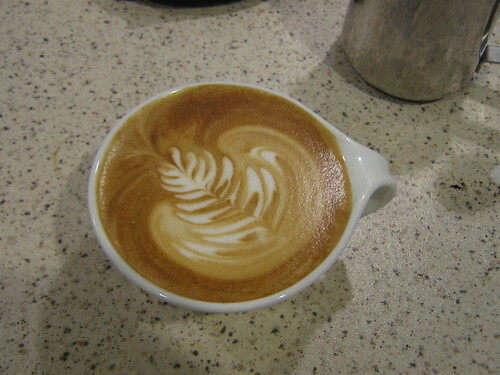 Also tried the above with 40lb tamp (slightly coarser grind). seems to have better results. But i’ll need a few more tries of this to confirm.- Tried Staub tamp (NESW)… higher % of channeling, i think due to crack in puck caused by multiple hard tamps. I could get a halfway-decent microfoam with the 4-hole tip. But never as fine as what I could get with the Silvia. I’m gonne give the 4-hole a bit more practice and see how it gets, will send findings later. If I leave the machine idle for a while. I’ll need to flush a bit longer. I flushed for 4 seconds (until the psshhh sound subsides), and got bitter coffee that burned my tongue. Now I flush 4 secs before I dose-dist-tamp the coffee, and flush another 3-4 secs just before lock & load. Seems better. Looks about in line with what I found. The double basket that comes with the Oscar definately loads more than the standard 14-16g. My brother prefers using the single basket. The Oscar does allow use of single basket with pretty consistent results. Check it out. I need to experiment further with the Espro tamp. Hope to get one soon. I am also looking to re-visit the 4hole soon. I heard that NS actually has a smaller 4 hole combo that is supposedly better at steaming low volume of milk. KF, maybe you might want to ask Danny to check with NS. It is also supposed to be free. I think if more of us actually ask for this we should be able to get it. This is a known problem with the Oscar. 4. I normally flush twice. Once before grinding the beans and once just before locking the portafilter. All in all a great machine. I’m sure that all of you will enjoy it to the max. One major difference between the Oscar and the Silvia. The Oscar is ready to pull shots almost instantly even after a steaming cycle. The Silvia takes time between shots. A lot of time…. Silvia’s strength is in its ease of use for a double shot. not using either stockfleth for NSEW yet still working on these moves. master the basic eg. WDT etc..
bathroom scale to get the 30lbs. Yet to try any of those suggestions. Master either Stockfelth or NSEW whichever you prefer. Key here is consistency & the dosage quantity. Adjust different dosage for different coffee blend & freshness. Yes, light tamp then hard tamp will do. If still insists on NSEW, make sure you lightly tamp the edges in the end, not hard tamp. What I find instead is twist the tamper 90degree clockwise & backwards will give you better result & in the process even the whole puck. Venky, get a better quality tamper that fits your hand rather than the Espro. Espro is suitable if you have big hands & want the 30lbs click. But you can always use a bathroom scale. I don’t think it is the fault of the 4 hole tip. It is the problem with the inconsistency steaming power, where the curve goes up & down in the whole steaming process as the boiler is small, causing not enough vortex in the milk. So microfoaming is still achievable but difficult. Of coz, there is another 4 hole tip that in the design is better than create better vortex, go & try ask for replacement. Yes, flushing after idle & flush just before locking the portafilter is just fine. We don’t want the water to just splash down but want a consistent stream of hot water to go through the puck. But Oscar is still quick compared to Silvia & will do its job once you master the quirks of the machine. Silvia is no easy machine too. In the end, it’s the end quality in the cup that matters. Any long thoughts, please email me and i will insert into this page. You can also send relevant photos. For short response, just insert into the comments area below. If you organize a Barista Jam at your place with enough incentives (like good food provided), someone may be willing to carry the entire machine to your place lah. I very interest regarding coffee maker. I hope can become your fan club. Thank you. I also planning open a cafe, so I hope you can give me suggestion. Thank you! have a nice day! Anybody know where to buy steam tip and adjustable opv online? Just got an Oscar in California. (USA) What did you end up learning over the years? What mods are worth doing? Only one thing is really needed. Install an OPV and tune the pressure to 9bar.